After watching her beloved sister, Sophia, pine over the town's golden boy for years, Miss Julia St. Claire has forsworn love and put herself firmly on the shelf. Unfortunately, her social-climbing mother and debt-ridden father have other ideas, and they jump at the chance to marry Julia off to the newly named Earl of Clivesden . . . the man of Sophia's dreams. Since resigning his cavalry commission, Benedict Revelstoke has spent his time in London avoiding the marriage mart. But when he discovers that the Earl of Clivesden has his sights set on Julia, Benedict tries to protect his childhood best friend from the man's advances-only to discover that more than friendship is driving his desire to defend her. He surprises them both with the force of his feelings. But when Julia refuses him, and her father announces her betrothal, Benedict fears he's lost her forever-until Julia approaches him with a shocking scheme that will ruin her for all respectable society and lead them into an exquisite world of forbidden pleasures. 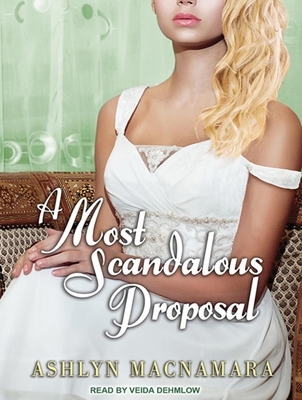 Ashlyn Macnamara is the author of "A Most Scandalous Proposal" and "A Most Devilish Rogue." A classically trained actress in England, Veida Dehmlow has dozens of stage credits to her name. Her voice work includes commercials, video games, and the narration of books in a variety of genres, including nonfiction, historical romance, short stories, and children's books.